In 2002, Virginia Minhondo and Angélica Perez were working as interns for a translation company in the U.S. They both wanted to move back to their home country, Argentina, while continuing to work with U.S. companies. So they decided to start an LSP together. 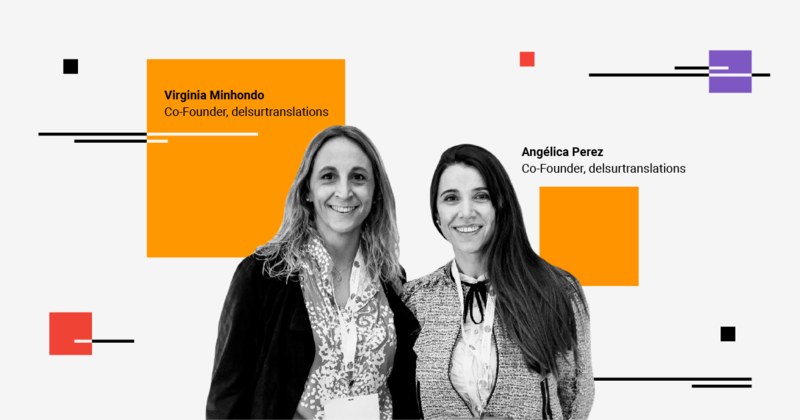 A year later, they were living in Argentina and offering Spanish translation services as co-founders of delsurtranslations. Over the past 16 years, they have experienced the same pains as many language service professionals, such as the expectation to increase their output at the same or reduced cost. And yet, Virginia and Angélica have managed to grow their business, adding Portuguese and indigenous languages, desktop publishing (DTP), project management and other staffing services, and expanding the number of global vendors they work with. In what follows, we focus on three ways that delsurtranslations is able to stay competitive and grow. Since there’s not much flexibility around traditional translation pricing, delsur adds new value to its clients by offering related services, such as cultural adaptation, desktop publishing, and linguistic quality assurance, among many others. Since these services are growing in demand with fewer vendors specializing in them, Virginia and Angelica have more room to negotiate a higher rate. The co-founders combine their growing familiarity with different types of technology with skill-sets that only human specialists can provide. “We’ve gotten to the point where everything is so automated that human services are really valuable,” Angélica explained. While many of the LSPs that delsur works with have yet to utilize machine translation, the rest of the company’s revenue related to MT comes from end customers in Argentina. At the beginning, it scared us and we didn’t know how to go with it. With the help of Smartcat, we’ve been able to add machine translation to our operations, and we are no longer afraid of it. We are using it actively to offer services to our local clients. Using machine translation has allowed delsur to provide translations services “faster and cheaper” to its end customers and increase its margin. “What we would normally produce in two days would take just one day using machine translation plus human post-editing,” Virginia said. “Part of growing our services meant that we would need to have a linguist working from Colombia or Mexico or Portugal, and it turned out to be very complicated and expensive,” Virginia said. They were using wire transfers, which cost around $100 per transfer and discouraged them from working with international vendors. To cut down on the transfer fees, they would consolidate payments on different projects, sometimes only sending one lump sum once or twice a year. “That was pretty unfair to them and to us, as well,” Virginia said. Now they use Smartcat to invoice customers and pay contractors located outside of their country, which is significantly cheaper per transaction. “Sending money from Argentina to other countries is very expensive, takes time and quite a lot of paperwork. With Smartcat, we saved money and we made it simpler,” Angélica explained. They now send payments once a month to all of their international suppliers. Virginia and Angélica are able to live in Argentina and expand their global business by investing in new technology and diversifying their service offerings. Smartcat makes this easier and cheaper. Try out the platform today and see how it can benefit your business.